Increasing temperatures at high altitudes are fueling the post-1950 growth spurt seen in bristlecone pines, the world's oldest trees, according to new research. Pines close to treeline have wider annual growth rings for the period from 1951 to 2000 than for the previous 3,700 years, reports a University of Arizona-led research team. Regional temperatures have increased, particularly at high elevations, during the same 50-year time period. Treeline is the zone, at high altitude or high latitude, beyond which no trees grow. "We're showing this increased growth rate at treeline in a number of locations," said Matthew W. Salzer, a research associate at UA's Laboratory of Tree-Ring Research. "It's unique in several millennia, and it's related specifically to treeline." Bristlecone pines live for thousands of years on dry, windswept, high-elevation mountain slopes in the western U.S. 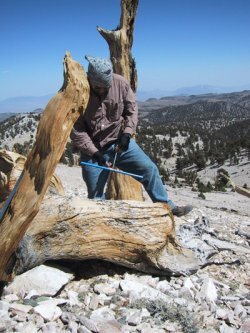 The scientists collected and analyzed tree rings from Great Basin bristlecone pines located in three mountain ranges in eastern California and Nevada that are separated by hundreds of miles. Only trees growing within about 500 feet (150 meters) of treeline showed the surge in growth. In general, those trees were at or above about 11,000 feet (3,300 meters) in elevation. "You can come downslope less than 200 vertical meters and sample the same species of tree, and it won't show the same wide band of growth," Salzer said. Growth at the pines' upper elevational range is limited by cold temperatures. At the lower elevations, growth of the trees is limited by moisture more than temperature, Salzer said. Co-author Malcolm K. Hughes said, "Something very unusual is happening at high elevations, and this is one more piece of evidence for that." One other example, he said, was the accelerated melting of small glaciers at high altitudes. "There is increasingly rapid warming in western North America," said Hughes, a UA Regents' Professor of dendrochronology. "The higher you go, the faster it's warming. We think our finding may be part of that whole phenomenon." Individual Great Basin bristlecone pines, Pinus longaeva, are the longest-living organisms known. The trees live at an elevation range of approximately 8,200 to 11,400 feet (about 2,500 to 3,500 meters). The oldest known living bristlecone, almost 5,000 years old, is in California's White Mountains. The trees' longevity coupled with the excellent preservation of trunks from even older dead trees has allowed some scientists to reconstruct regional climate 8,000 years into the past using tree-ring records from bristlecone pines. The recent rapid growth of three species of pines at elevations close to treeline had been noticed more than 25 years ago by previous researchers from UA's Laboratory of Tree-Ring Research. The sudden growth surge was puzzling in trees hundreds to thousands of years old, well past adolescence. "It means there has been some environmental change that affected the trees' ability to make wood," Salzer said. "The place they were living wasn't as limiting to their growth anymore." Salzer and his colleagues wanted to study trees whose growth was strongly affected by temperature. "Where do you go to look for trees where ring width is related to temperature? You look for trees in high mountain ranges, where the mountain continues up and the trees don't follow," Salzer said. "As you go up, the main thing that's changing in these places is temperature." Salzer and his colleagues chose to extend the previous research efforts. The scientists used the previous researchers' data and also took new bristlecone pine cores to increase the number of samples available for analysis. The team analyzed the average and median width of tree rings for 50-year blocks of time, starting with the latter half of the 20th century, the years 1951 to 2000, and going backward in time to 2650 B.C. The analysis spans more than 4,600 years. To see how the annual growth rings changed with temperature, the team used a new method of mapping climate data called PRISM that was unavailable to researchers 25 years ago. PRISM combines weather records and knowledge of how topography affects weather and climate to provide state-of-the-art climate information going back 100 years for specific locations. PRISM stands for Parameter-elevation Regressions on Independent Slopes Model. The tree-ring researchers found that the chronological timing of the wider tree rings correlates with increasing temperatures from the PRISM climate map. Hughes said that increasing temperatures high in the mountains could have significant effects elsewhere. In many areas of the western U.S., mountains are a key source of water for farms and urban areas at lower elevations. "If the snow melts earlier, the mountains won't be able to hold onto water for as long," Hughes said. "They won't be as effective as water towers for us." The same pattern of high-elevation growth increases has also been observed in Rocky Mountain bristlecone pines, including those found in Arizona's San Francisco Peaks, Salzer said. He plans to expand the research to investigate high-altitude trees at additional locations.